Slogans demystify political discourse. Master texts from Aristotle’s Politics to Kautilya’s Arthashastra to Hobbes’s Levi­athan and Hannah Arendt’s The Human Condition all emphasise that politics is human thought at the brink—ferociously ambitious but also frustratingly amorphous and ambiguous. The appeal of the slogan is that it reduces this immense complexity to a primal simplicity, to the level of syntactic patterning that a child learns in infancy when it starts out on a lifelong language adventure by producing basic two-word utterances, such as ‘want milk’ or ‘big house’. 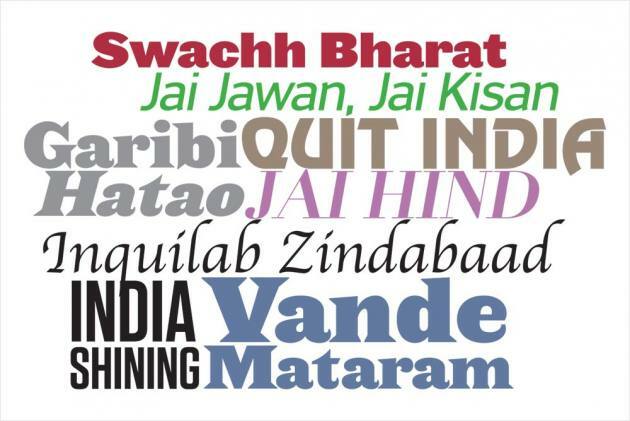 Consider five memorable national slogans from recent Indian political history: Quit India (1942), Jai Jawan, Jai Kisan (1965), Garibi Hatao (1971), India Shining (2004), Swachh Bharat (2014). Not only do these consist in the main of two words but they also manifest as many as three out of the five speech-act structures (commissives, declaratives, directives, expressives and representatives) that philosophers of language consider the basic bui­lding blocks of communication The stark directive (Quit India, Garibi Hatao), the alluring rep­r­ese­ntative (India Shining, Swachh Bharat) and the arousing expressive (Jai Jawan, Jai Kisan!) are all on flamboyant display here. Missing are com­missives (promises) and declaratives (assertions of self and party worth). Both these forms of language (promising and declaring) are, in fact, ­essential parts of the political toolkit; their natural homes, though, are the manifesto and the monologue. In contrast, the slogan is not and by its cognitive logic cannot be, long form. It must hammer its nail into the wall of memory with a single blow. Unlike the manifesto that is an extended declaration on behalf of the party and the monologue consisting of thumping oratorical speech, the slogan is not a marathon runner but a sprinter whose mission is to break through endurance barriers. I want to argue in this piece that two words are an optimal, enduring length for political slogans. However, I should clarify right away that it is emphatically not my case that every successful slogan consists of two words or that all two-word slogans are successful. Counterexamples to such a thesis would obviously be legion. Rather, the two-word rule of thumb is a norm (an example from the unrelated domain of, let’s say, food, might be the injunction not to eat more than two rotis at lunch for the sake of health). Now, the point about norms is that they are persistently broken—but this does not mean that they are not an ideal to aspire to, nor that they lack an internal logic. We will return to the sloganeering magic of two words a little later but let’s think, for a ­moment, of the closest rivals flanking it on either side: one-word slogans or those consisting of three or four words. One-word slogans, it turns out, are hard to ­locate—the reason very likely being, as I suggested earlier, that they lack the syntactic power of conjoining ideas. As for three- and four-word slogans, there are several successful examples of these, such as the 2009 Trinamool Congress slogan Ma, Mati, Manush or the 2014 BJP one, Abki Baar, Modi Sarkar. Note, however, that the farther you stray from the normative two-word metric, the more dependent you are on language resources typically associated with poetry: namely, rhyme, rhythm, alliteration, repetition and so forth. A bomb dropped by the Japanese! O my God! The British said. This little verse certainly sets up the political tableaux in the local context of Bengal in the mid-1940s with humour and verve. But I think we can all agree that it is not a slogan. Compare this punchy poem now to another striking verbal inv­ention by Subhash Chandra Bose’s aide, Abid Hasan from Hyderabad, and you will immediately spot the difference. For, Abid’s two-word coinage has long gone nationally viral. Indeed, India’s ‘sense of self’ would, I surmise, be severely damaged if we were to somehow erase from our ­national memory bank his tiny two-word formulation, which was: Jai Hind! Evident then, from quasi-political rallying cries like Jai Hind and Vande Mataram as well as from generic slogans such as Inquilab Zindabad, is the efficacy of the two-word norm. It is true, of course, that sometimes a charismatic leader like Jayaprakash Narayan does audaciously succeed in doubling an entrenched two-word slogan such as Indira Gandhi’s Garibi Hatao to Desh Bachao, Indira Hatao at a time of grave national crisis such as the Emergency. Yet, one could argue that it is the robust brevity of the original that made such a move possible in the first place! Other ­indirect evidence in favour of my conjecture comes from the fact that politicians can be frequently ­observed building on previous slogans. Thus PM Atal Behari Vajpayee embellished PM Shastri’s indelible Jai Jawan, Jai Kisan by adding Jai Vigyan to it in the 1998 post-Pokhran scenario, while PM Modi has added Jai Anusandhan to the concatenation in 2019. What is noticeable here is the manner in which the political unconscious stubbornly tracks back to the original in such INS­tances. Three, four, five words or more only recall the original two more strongly. A slogan has many cousins: in graffiti, in adv­ertising, in poetry. Yet, as the etymological origin of this English word (from the Gaelic sluagh-ghairm, ‘army’ or ‘host’ + ‘cry’) tells us, its core meaning approximates to a ‘battle cry’. In political war games, then, slogans comprise the vanguard of the infantry. They are by no means the main ­factor in winning battles for political supremacy but they do die on the hill trying. Likewise, the common Hindi equivalent of the slogan, nara from the Arabic naar, deals in the short-fuse language of motivation, desire and ­do-or-die moments. As sensitive barometers of the political mood, whether of approval or anger, the most lasting naras tend to outlive their ­imm­ediate temporal motivations and enter meme-space as a basic language resource. In this sense, the humble slogan constitutes the key signature of political hope. That is why we cannot afford to dismiss it lightly.